Today I was at the Toastmasters meeting and afterwards realized the streets were a bit wet. And I realized something that I had never noticed this intensely: The busy street where many cars were driving was already dry, the smaller street was still slightly wet and the bike lanes were completely soaked. That must be due to the temperature of the engines of the cars as well as the air conditioning. The cars are actually drying and heating up the streets! 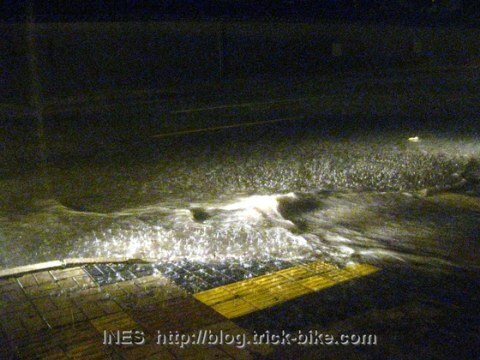 So I was cycling on the car lanes as I do not have any fenders on my fixed gear bike. Later I went to a restaurant about 150 meters away from my home. It started raining when we started eating. And it just got heavier and heavier. 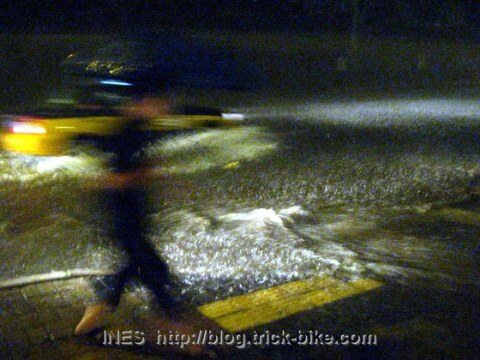 The drops were really huge and there were soon big puddles on the streets. The cars driving by were almost floating in the water. And we had to cycle home! We waited for quite a while after finishing the dinner but the rain did not get any lighter. So at a certain point I put on my rain gear and took off my shoes and got completely drenched on those 150 meters with me feet on my pedals going under water with every revolution. This entry was posted on Donnerstag, Juli 30th, 2009 at 23:23 and is filed under Beijing, China. You can follow any responses to this entry through the RSS 2.0 feed. Both comments and pings are currently closed.